Kelley announced via Twitter on Monday that the sophomore quarterback will transfer from the program. FAYETTEVILLE (KFSM) – Cole Kelley won’t take another snap as an Arkansas Razorback. The Lafayette, Louisiana native played in 18 games over two seasons, starting six contests. Kelley started in the season-opening win over Eastern Illinois and the week three loss to North Texas before giving way to Ty Storey. Kelley redshirted in 2016, before seeing action in 2017, winning SEC Freshman of the Week after leading a comeback win at Ole Miss. That happens to be the Razorbacks most recent conference win. The freshman finished 87/151 (58%) for 1,038 yards with 8 TD and 3 INT to go along with a pair of rushing TD. Kelley took over the role after starter Austin Allen was injured. Debuting as the starter in 2018, Kelley played in nine games completing 35 of 67 (52%) passes for 455 yards, 5 TD and 5 INT. Kelley’s major role came as a short yardage quarterback, rushing 28 times for 73 yards and 3 TD. 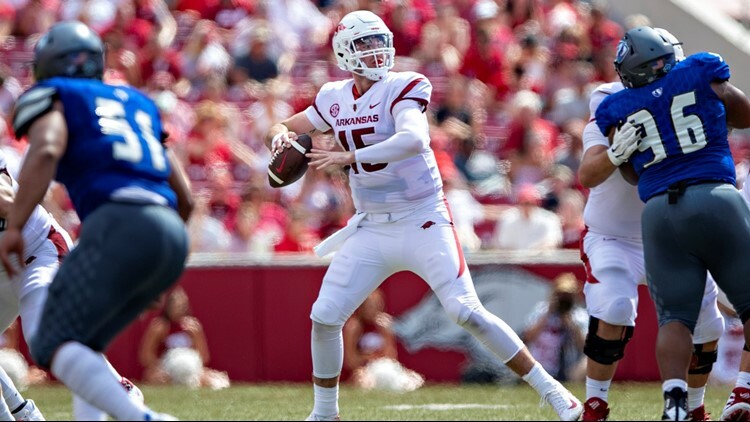 As of now, there are a slew of quarterbacks on the Razorback roster entering next season including Storey, Connor Noland, John Stephen Jones, and Daulton Hyatt. KJ Jefferson, an incoming freshman from North Panola, Mississippi will join the program. And there’s a chance that graduate transfer Kelly Bryant from Clemson chooses to reunite with Chad Morris. Arkansas finished the 2018 season 2-10, the first time losing 10 games in program history.